Fred: You received the Rod of- wait. I don't remember that happening. Bob: Yeah, I got the Rod of Versatility from Gary. Fred: Then why didn't you use it at any point in the following storylines? It would have been useful. Fred: The three of us arrived in Townwithanequipmentstoreaplacewithmapsandatavernofcourse. Then, because you're a moron, you somehow managed to glitch D&D. Gary was forced to reset the game without any saved state, so you were essentially returned to your starting place. 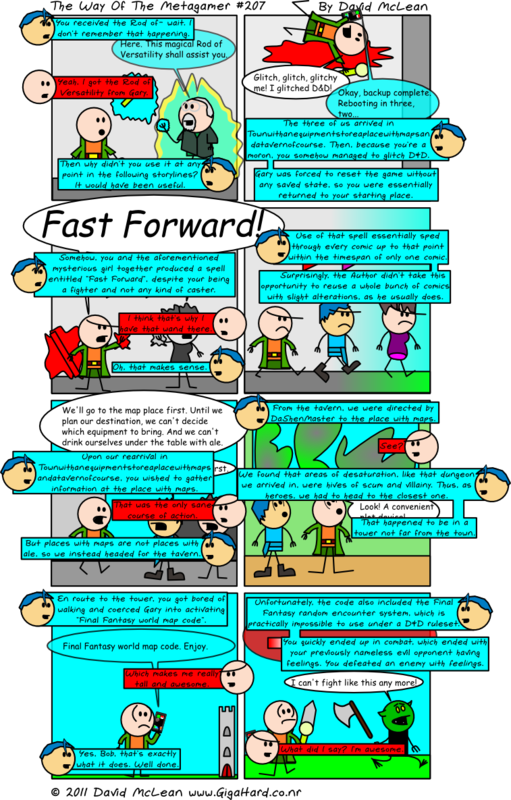 Fred: Somehow, you and the aforementioned mysterious girl together produced a spell entitled "Fast Forward", despite your being a fighter and not any kind of caster. Bob: I think that's why I have that wand there. Fred: Oh, that makes sense. Fred: Use of that spell essentially sped through every comic up to that point within the timespan of only one comic. Surprisingly, the Author didn't take this opportunity to reuse a whole bunch of comics with slight alterations, as he usually does. Fred: Upon our rearrival in Townwithanequipmentstoreaplacewithmapsandatavernofcourse, you wished to gather information at the place with maps. Bob: That was the only sane course of action. Fred: But places with maps are not places with ale, so we instead headed for the tavern. Fred: From the tavern, we were directed by DaShenMaster to the place with maps. Fred: We found that areas of desaturation, like that dungeon we arrived in, were hives of scum and villainy. Thus, as heroes, we had to head to the closest one. That happened to be in a tower not far from the town. Fred: En route to the tower, you got bored of walking and coerced Gary into activating "Final Fantasy world map code". Bob: Which makes me really tall and awesome. Fred: Yes, Bob, that's exactly what it does. Well done. Fred: Unfortunately, the code also included the Final Fantasy random encounter system, which is practically impossible to use under a D&D ruleset. You quickly ended up in combat, which ended with your previously nameless evil opponent having feelings. You defeated an enemy with *feelings*. Bob: What did I say? I'm awesome.